Why do we celebrate our birthdays? Old age isn’t so bad when you consider the alternative – Anonymous. Celebrating birthdays is celebrating life and that is simply a treasure, and celebrating it with family and friends is even more so. Life should be celebrated every day and not just on your birthday. Since we can’t fill up on cake and all the nasties every day, we unfortunately have to limit it to a few selected days, our birthday and friends birthdays. The question however arises, where do birthday celebrations come from? According to the Huffington Post, what they gathered from hypotheses, we get to celebrate our birthdays the way we do (parties, candles, cakes, birthday songs and gifts) from various times in history. Let’s take a look at where everything started. The Huffington Post cited scholars that hypothesise that the Egyptians started parties on the coronation of the Pharaoh, when it was said to believe that the Pharaohs transformed into gods when crowned. The celebration of their “godly” birthdate would then surpass their actual birthdate and the celebration is what we know today as the party. And with every party, there should be cake! A few years later, the idea of a birthday celebration had taken off into the world. The idea of lit candles on cakes, came from the Greeks, according to the Huffington Post. To recreate the radiance of the moon and the perceived beauty of the lunar goddess – Artemis. As a form of tribute to the goddess, the Greeks lit the candles on the cake for a glowing effect. Along with blowing out the candles on the cakes, comes making a wish. The Huffington Post suggests that the closest connection to the contemporary birthday party was the German Kinderfeste in the late 18th century. Kinderfeste was held to honour a child at their first birthday. They lit a candle on the cake for each year the child had been alive, adding another one to symbolise the hope of living at least one more year. Blowing out the candles and making a wish was part of the celebrations. Celebrating life with friends and loved ones is often than not the reason for a birthday party. 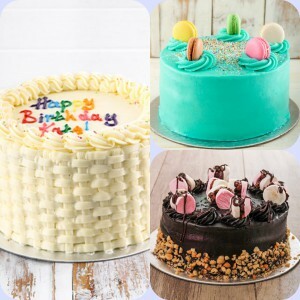 The best way to celebrate a friend or loved one at their birthday party is by getting them a beautifully decorated and fresh birthday cake from The Bakery at NetFlorist. There is a wide range of delectable cakes ready for you to order and devour for the sake of celebration. Don’t forget the candles! The Bakery @ NetFlorist has you covered! According to the Huffington Post we can thank Robert Coleman for adding a few lyrics to an already widespread song written by Patty Hill and Mildred J. Hill, “Good Morning to All” in 1893. The Huffington Post confirms that in 1924 Coleman added a few lyrics to the nationwide song, and it quickly spread like wildfire and became the famous version we all sing to this day: “Happy birthday to you”. After Happy Birthday to you, the candles blown out, the wish made and a piece of cake for everyone, we focus our attention on the birthday girl or boy to open their gifts. Gifting has been around since the beginning of time. It is inherently human to gift loved ones with something to show they care. An example hereof is the Native Americans who have been known to celebrate gift-giving with potlatch for thousands of years – marking life events like births, adoptions, weddings and other inter-tribal events. Amazing birthday gifts for him! The idea of gifting, being inherent to any human, will thus be automatically on your list when going to a birthday party. Getting the perfect gift doesn’t need to have you in twists and knots. NetFlorist has the perfect gift on their website just for you. In conclusion, we have learned the history of birthdays, from the party that started with the Egyptian Pharaohs to the gifts being inherent to each and every one. You know where to find mouth-watering birthday cake and of course the gifts for the birthday girl or boy – nowhere else than at NetFlorist! Go on, celebrate life and even old age, it’s better than the alternative – not celebrating life. Have a super fabulous full-o-good-stuff kind of day!